The 1986 Stanley Cup playoffs, the championship of the National Hockey League (NHL) began on April 9, after the conclusion of the 1985–86 NHL season. The playoffs concluded on May 24 with the champion Montreal Canadiens defeating the Calgary Flames 4–1 to win the series four games to one and win the Stanley Cup. This was the last time to date that all active Canadian teams have qualified in the same season. It is also the second time that all seven active teams at the time qualified, the first occurring three years earlier. The playoffs of 1986 saw three first place teams eliminated in the opening round and the fourth, Edmonton, bowed out in the second. This would be the last time that all six Sutter brothers would participate in the playoffs in the same year. The Montreal Canadiens decided to go with a rookie goaltender by the name of Patrick Roy. This decision proved to be a good one just like when the Canadiens rode rookie goalie Ken Dryden to a Stanley Cup championship in 1971. In the Final, the Canadiens beat the Calgary Flames, who were also riding a rookie netminder, Mike Vernon. Patrick Roy won the Conn Smythe Trophy as the playoff MVP and had a sparkling 1.92 goals against average along with 15 wins. St. Louis forwards Doug Gilmour and Bernie Federko led the playoffs in scoring with 21 points despite missing the finals; this feat was not repeated until 1999. The 1986 playoffs marked the first time that all four former WHA teams made the playoffs in the same year. This would happen again the following year and in 1999, by which time 3 of those teams had moved, the Quebec Nordiques to Denver, the Winnipeg Jets to Phoenix, and the Hartford Whalers to Raleigh, North Carolina. This was Hartford's lone playoff series victory in their NHL history prior to moving to Carolina. The upstart Whalers pushed the eventual Stanley Cup Champions to the limit before falling. Claude Lemieux scored the series-winning overtime goal for Montreal. The deciding goal of game seven between the Oilers and Flames was scored five minutes into the third period when Edmonton's Steve Smith attempted a cross-ice pass from the side of his own net and the puck struck goaltender Grant Fuhr's leg and went into the Edmonton goal. This goal is significant because it eliminated the Oilers from the playoffs and prevented them from possibly winning a third straight Stanley Cup. To date this is the Flames' only playoff series victory over the Oilers. This series is best remembered for the third game, in which the Rangers badly outshot the Habs, but were stymied by Patrick Roy. Another Montreal rookie, Claude Lemieux, scored in overtime—his second overtime goal of the playoffs. In Game 6, the Flames led 4–1 after two periods and 5–2 early in the third, but the Blues came back to tie it and then won on an overtime goal by Doug Wickenheiser. In Game 7, the Flames were up 2–0 before the Blues scored in the third to cut the lead in half. There wouldn't be another comeback, though, as Mike Vernon and the Flames withstood a late assault to advance to their first Stanley Cup Final. This was the first playoff series between these two teams. This was the Canadiens thirty-second appearance in the Finals, while the Flames were making their first appearance in the Finals. 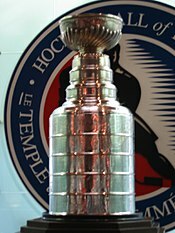 Montreal had most recently won the Stanley Cup in 1979. The Flames became the first team to represent Calgary in the Finals since the 1923–24 Calgary Tigers who were defeated by the same Montreal Canadiens. In game two Montreal's Brian Skrudland set an NHL and Stanley Cup Finals record for the quickest overtime goal in history, scoring just nine seconds into the first overtime period.